250 Mix Assorted Gents Ties and Bow Ties Collection Various Designs for Formal In-Formal Casual Work Office Use - ONLY 23P Per Tie ! 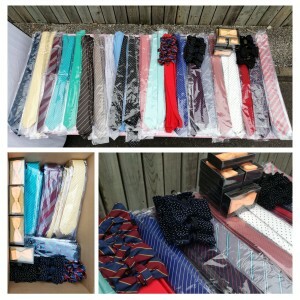 A mixture of 250x Ties and Bow Ties. Various designs include Striped, Spotted, Plain, Flower Patterns, Etc. 25 Different Styles, 10x of each style. Suitable for Weddings, Events, Dinner, Fancy Dress, Drama & Acting Etc. - 250 Mix Assorted Gents Ties and Bow Ties Collection Various Designs for Formal In-Formal Casual Work Office Use - ONLY 23P Per Tie ! - 50 Gel Pad Bike Bicycle Cycle Comfort Gel Padded Cushion Seat Cover Saddle - ONLY 79P Each - BARGAIN! We are a wholesale trade site. Prices show are exclusive of VAT unless otherwise stated.